It was quite the wild night for one man. 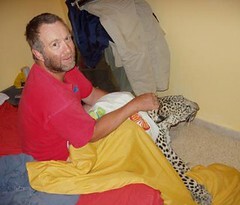 While sleeping, this 49-year-old nature guide woke up to find a wild cat jumping through his window and hopping into his bed with his family. The man wrestled the leopard to the floor and pinned the cat down for 20 minutes until the rangers arrived. The man said the leopard was probably lured into the house looking for food (the leopard was chasing the pet cat). The leopard only weighed 44 pounds and vets say that they found evidence of a degenerative joint disease. The leopard will be treated by vets and will likely be returned to the wild. This entry was posted on Tuesday, May 29th, 2007 at 12:55 pm	and is filed under Other Pets, Cats, National Dog, Cat & Pet Info, News for Cats, Dogs & Owners. You can follow any responses to this entry through the RSS 2.0 feed. Both comments and pings are currently closed.